We get a lot of questions at skiboards.com regarding skiboard bindings. I am writing this brief article to explain the pro’s and con’s of various binding options as well as dispelling some of the myths about skiboard bindings. First, there are basically four types of bindings that you can use with skiboards (snowblades, ski blades, ski boards, short skis – yes these are referred to by many names). These bindings do not release if you fall. The advantages of these are that they don’t release prematurely either (though release bindings adjusted properly usually don’t pre-release). These bindings are usually less expensive than release ski bindings. Non-release skiboard bindings, while all adjustable to a range of ski boot sizes, vary in terms of construction, durability, performance and how they mount to the skiboards. With the higher end, usually aluminum or steel non-release bindings, mounting is usually in a standard 40mm X 40 mm screw mounting pattern. These are mounted into stainless steel inserts preinstalled in the skiboards during manufacturing. Examples of these skiboards would be the Snowjam 75, Snowjam 90, Summit ZR88, Summit Ecstatic 99 and the Summit Custom 110. Non-release skiboard bindings also come in a composite construction. These are still adjustable, mounting with screws drilled directly into the skiboards, usually in an 8 hole configuration. They are not made to fit inserts but usually come with less expensive skiboards that don’t have inserts. These bindings are lighter, and much less expensive but won’t take the abuse that the metal bindings will. The price is significantly less however and they do allow some flex, though less than the higher performance release ski bindings. Examples of these are the Snowjam 75 and 90cm and Sporten Fun Carver 99. These do also adjust to a range of ski boots sizes. All ski resorts require leashes to be used, one per leg, for non-release bindings. This is so, in the event they get away from you, they won’t fly down the hill. Myth 1: Non-release bindings mounted in a 4 hole insert pattern allow for the best flex of skiboards while ski-type release bindings inhibit flex, thus not allowing full performance. While this may be true regarding the composite non-release bindings (that inhibit flex somewhat), this is not true for the ski bindings manufactured by the major ski companies such as Elan, Atomic, Head/Tyrolia, Salomon or Rossignol, for example. These release bindings allow the full flex of the skiboards (or skis). Many years of research go into the design of these ski bindings in order to achieve this very purpose. This is true whether the bindings are adjustable or custom fitted. These bindings do release in case of a fall, usually in many directions, to prevent a variety of injuries. These ski bindings mount directly into the skiboards, usually with 8 screws like ski bindings on skis. Most release bindings allow for the full flex of the skiboards. The major disadvantage is cost, as the many included safety features basically cost more. These will tend to weigh slightly more than most other bindings with the exception of the Bomber Bindings., though this isn’t noticeable when riding downhill. Leashes are not necessary with release bindings as they come with brakes that come down when the bindings come off to hold them in place so they don’t get away from you. The major advantage of these is that they make skiboards the safest snowriding tool on the mountain (as compared to skis, snowboards or tele skis). The other advantage is that you can just step in and go, whereas the non-release bindings require more time to get on and off (and bending over). 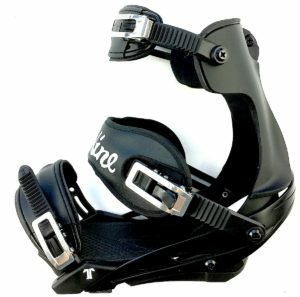 Release bindings can come in a model that adjusts to many different boot sizes such as the Atomic XTE Adjustable Bindings. Adjustable bindings usually use a rail to slide the toe and heel piece easily to fit your ski boots. There are also release bindings that are just a toe and heel piece with brake that are fitted exactly to your boot size and don’t adjust. Depending on the width of the skiboards, sometimes wider brakes are necessary so they can clear the skiboard and work like they are supposed to. Skiboards.com provides these brakes at no additional charge. Release bindings are adjusted based on your ability level, size of boots and weight. Certified technicians need to adjust the “DIN” to make sure they release when they are supposed to. This takes about a minute at most ski shops or resorts. Myth 2: It is necessary to use release bindings mounted on a riser plate that fits the 4 hole standard mounting pattern (fits into the 4 inserts) in order to maintain proper flex of the skiboards. An example is the Spruce Riser plate and bindings. This is a myth and simply not true. Worse, these can be dangerous. None of the major ski binding manufacturers endorse modifications to how their bindings are mounted to either skiboards or skis. Their comment is that there is no way to tell if these bindings will release when they are supposed to, as the riser introduces a foreign element into the equation. In addition you lose the convenience of step in and go, as you have to still use leashes, as brakes don’t work due to the additional height. We will not sell these. Myth 3: Risers plates upon which bindings are mounted (for release bindings) will improve carving ability. No, what improves carving ability is the design of the skiboards you use, as well as their inner construction. Higher performance skiboards carve more aggressively. The deeper, parabolic sidecut allows for aggressive carving and of course the ability to lean so your edges will do the job they were designed for. This lean is natural and feels simply like “riding the edges”. A riser is not required to improve the carving ability of true high performance skiboards. The only exception is for snowboard bindings as these will require a riser to perform properly and not catch edges. The Summit Snowboard Binding Riser Kit offers a platform with round carving disc that allows for precision carving without inhibiting flex. side, it is easier to ride skiboards off the back tails. It is also recommended to add an additional retention strap towards the top to achieve maximum power transfer to the edges in side-to-side carving such as the Booster Extreme Straps. This helps distribute the weight better. We do offer the Technine Custom Pro DS Snowboard Bindings made exclusively for skiboards to allow best performance. Skiboards can also be mounted with AT bindings, meaning bindings that will allow for climbing uphill with a lever that allows for freeing your heels to make climbing easier. They can then be locked down when coming downhill like a normal ski binding. Most use these bindings for backcountry riding. An example of this kind of binding is the Atomic N Tracker bindings which we offer. They are more expensive, but also the most versatile of all bindings. These are adjustable to a range of ski boots sizes and the DIN can be set just like other release bindings. Myth 4: Skiboards are dangerous no matter what the bindings. This is definitely untrue and usually something someone not knowledgable about skiboards would say. We do hear this all the time. The truth is skis are way more dangerous than skiboards. Lets see – you rarely cross tips, or ever, can turn fast, stop fast, get through anything and don’t usually need lessons. This is the biggest myth of all, especially if you consider release bindings on the longer skiboards. You can view skiboarding videos on our website to see the differences between release and non-release bindings to show you how to get in and out of them so you can make an informed decision. Shorter skiboards do not come with release bindings as they are too short to accommodate ski bindings. However, shorter means even less chance of getting into a predicament so you just get back up when you fall like on skates. The shortest skiboards we offer with full ski release bindings start at 79cm & and up from there. Read more about skiboard bindings and advantages of each.